My father and I were fishing on a "head boat" out of Dauphin Island, Alabama, and witnessed not 1 single water spout as shown above, but 3 at the same time. 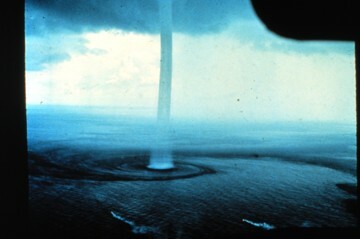 We asked the captain what would happen if we collided with one, and his reply was "we'll just get real wet." Luckily, we didn't get to test the captains integrity. 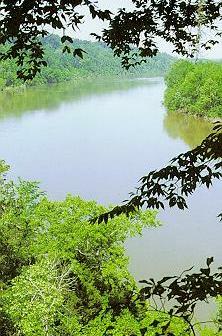 The Alabama River picture was chosen because it's a good example to use for a section on "planning and outfitting". Dates (timing is everything), Boats, Gear, and Food. A Trip Planner would be useful too. Who is traveling with you, and what is their available time schedule? Do you already own a boat suitable for this trip, or will you borrow, lease or build a boat? To obtain estimates for the distances on water you'll be traveling, see the Distances sub-menu in Planning . Most of these distance calculators are derived from a PDF document called Distances Between United States Ports by NOAA and the U.S. Dept. of Commerce. If your river is not included in the port-to-port calculators, stay tuned to this site....they're on the way! The distance charts in the PDF are currently being converted by this site to the more convenient online format. Once distances are estimated, estimate your "Time of Transit" using the Calculator and Charts referenced in the Calculator main menu. If your boat has been selected, use the "Range and Fuel Cost" calculator, to estimate number of stops for fuel, and costs. Do you plan to travel on the Great Lakes or Offshore? If so, you may find the "Great Circle" Calculator link handy.